The striking growth of PV energy among all types of renewable energy, as demonstrated in recent years, has proven the ability of solar plants to influence on the global energy model and play a leading role in global energy transit. Providing access to energy for PV-energy is no less important. Mainly such access can be provided for off-network PV solutions and installations at an early age. 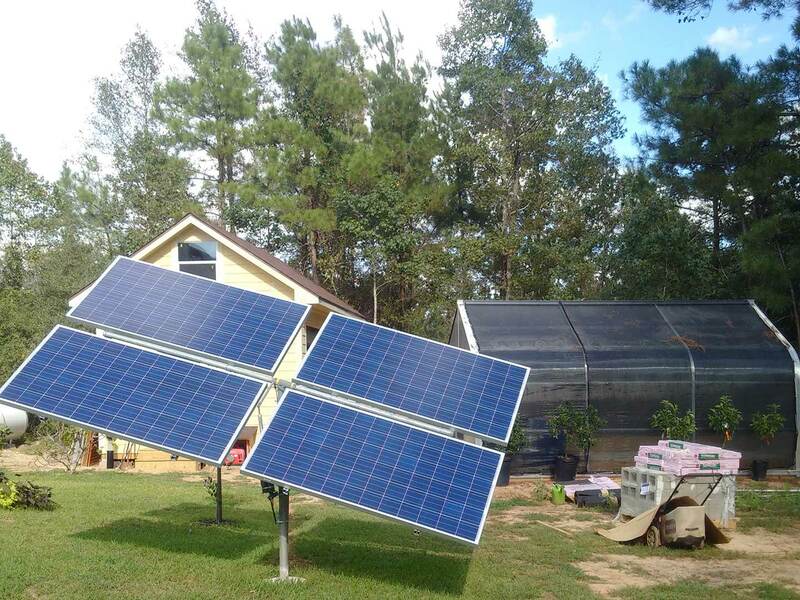 Photo: Off-grid PV-tracker with an effective capacity of 1.2 kW for feeding the private greenhouse in Montgomery County, Texas, USA. 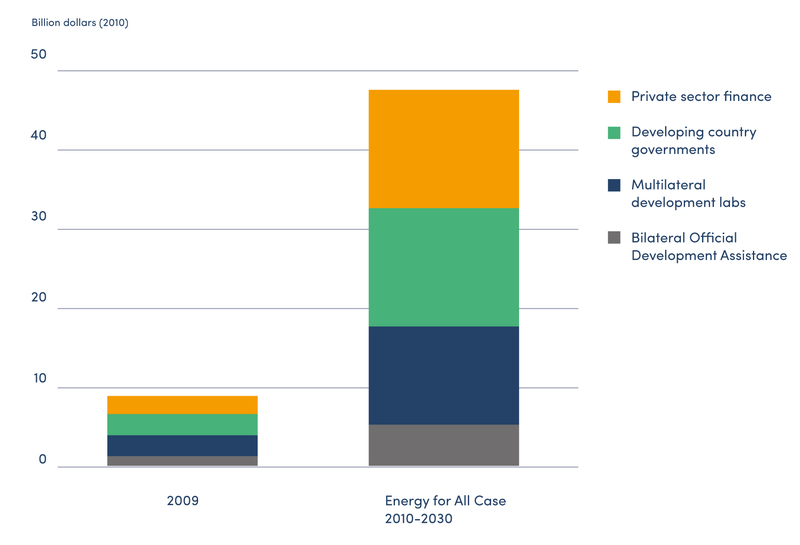 During the last decade, the measurements and importance of the problem of access to energy was first recognized by the United Nations as one of the most urgent humanitarian problems (SDG 7, UN, 2018), for which a global program was developed to ensure “universal access to achievable, reliable, stable and modern energy for all by 2030 “. It should be admitted that today there is no way in the world to catch up with the planned level of universal access to energy by that date – there are many countries, especially slow-growing remote and rural areas. According to the International Energy Agency (IEC) from 2014 to 2016, access to electricity from households in the world increased by only 0.83% per year, which is below the required growth rate of 0.9%, and at the current pace of more than half a billion people on the planet (674 million) by 2030 will not have any access to electricity. Much has been said about the importance of off-grid PV solutions for global energy transit. Ensuring access to energy in general and, in particular, RES is an important factor in the transformation of the world’s energy. According to expert data, increased access to electricity is currently due to PV technology, and in the future also relies on PV-solution. According to statistics of the IRENA Technical Report “Measurement and estimation of off-grid solar, hydro and biogas energy” for December 2018, see. Fig. 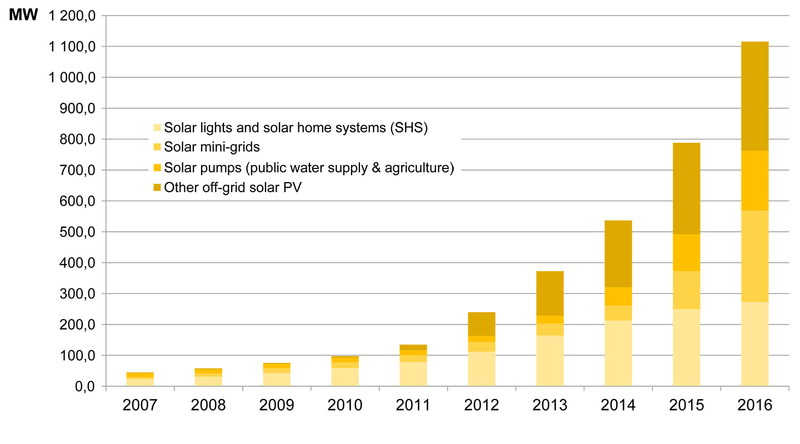 2, the power of off-grid user-installed PV installations increased ten times over decades. Especially quickly increases in the supply of electricity from mini-electrics, as opposed to the use of small solar devices, such as solar home-based systems of low power and solar lighting. An important part is the use of off-grid solutions for water supply systems and agriculture, as well as other local technological needs. This part of the energy sector, including the generation of electricity from these sources, is often absent from official statistics on energy; therefore, under the current method, all credentials are more of an estimated nature; they are often computed indirectly, sometimes based on the data of export / import of PV components, and data bases of development projects. For example, in the table from the report dated by the end of 2018, the adjusted data is given as of 2016. So, in a way, statistics for off-grid energy can be estimated not as an absolute measure, but as a demonstration of trends. Table 1. Adjusted power data of off-grid installations from different types of RES at the end of 2016, MW. Source: IRENA "Measurement and estimation of off-grid solar, hydro and biogas energy", Dec 2018. Almost all increase in the use of electricity out of the grid has occurred over the past 5 years – to a large extent due to availability increase, supply growth and cost reduction of solar power devices of low power, in the first place sets for PV-lighting. It is a pity but must be admitted that these devices provide only with light or charge of low-power devices (such as mobile phones) and do not provide access to a wide range of energy services in developing countries. 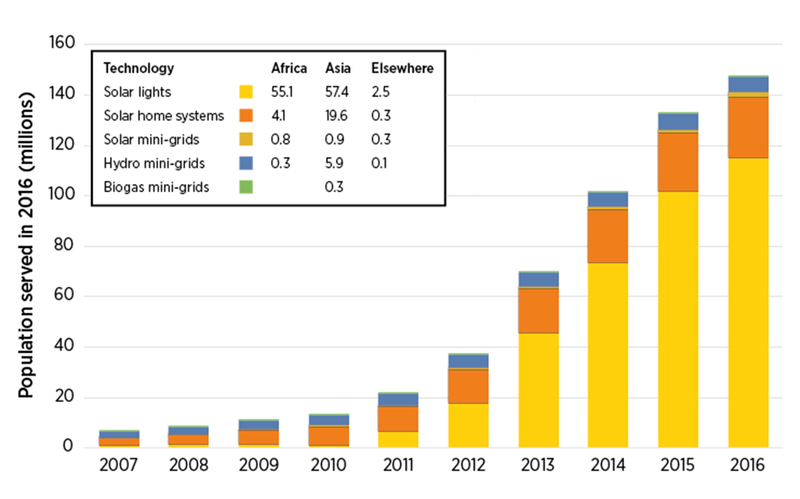 Only around 30% of people in Asia receive a higher level of off-grid services related to domestic solar systems with a power of> 2 kW and mini networks, and in Africa, this share is hardly more than 10% of the population covered by off-network solutions. Fig. 2. Power and distribution of off-grid PV-installations, 2007-2016, MW. Source: IRENA "Measurement and estimation of off-grid solar, hydro and biogas energy", Dec 2018. Despite the impressive pace of deployment of off-grid solutions in the world, according to the International Energy Agency estimates, to reach the planned level of universal access to energy by 2030, the level of investment should increase about 5 times compared to the level of 2009. Fig. 3 shows the increase in the required annual investment with the proposed sources of funding. It is necessary to increase both public and private investments substantially and rapidly. In order to achieve the required level of investment, a large part of public funding needs to be deployed in such a way as to encourage the attraction of private investment. Fig. 3. Necessary level of investment in the off-grid system with RES of all types. Source: GOGLA Providing Energy Access through the Off-Grid Solar: Guidance for Governments, Jan 2019. The private sector can play a vital role in filling the existing gap in energy access through off-grid and mini-grid subsidies. This is especially true to providing access to electricity for households with solar installations outside the grid. Solar off-grid and mini-grid PV solutions can provide access to power sources faster than solutions for projects to expand access to the common grid. Forecasts from the GOGLA Association of Experts on future growth for the entire sector of off-line solutions show growth to 2022 by 25% in the annual calculation of sales volumes of components of these systems. Even in those countries where the purpose of the government is to provide solutions that are mainly based on the development of the grid infrastructure, off-grid solutions accelerate the process of general electrification. Offshore solutions can achieve results for several years or even decades earlier than expansion plans, and it will accelerate economic development in remote areas or where existing networks do not have the required capacity. A market-based approach to promoting sunny small-scale networks and autonomous solutions can provide households with access to electricity on a scale, at speed and at a fairly low cost to the government, which makes it an attractive option for countries with limited resources. It is clear that access to the electricity of the population motivates a private initiative on self-employment and directly affects the pace of economic development of the country. The further the community is remote from the stationary electricity grid, the more expanding the network infrastructure is compared to off-network solutions. For example, the association GOGLA counted (as per the price level in 2015) and found that for the 100 thousand people who do not have access to electricity at all, the base off-network lighting from solar installations could be realized for the amount of about $ 3 million. Thus, it is exactly the power of lighting (for 23 hours a day), but from the fixed electricity grid, on which was necessary to spend already $ 150 million. When the cost of the expansion of the fixed network becomes exorbitant, mini-networks or autonomous, solar off-grid systems become more advantageous solution. 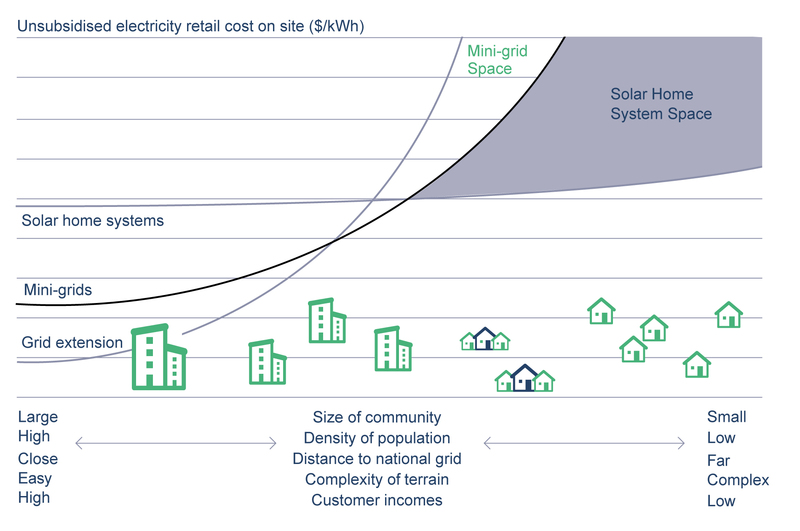 Mini-networks are likely to be viable in densely populated areas or energy-intensive economic activities, while autonomous solutions are more economical in sparsely populated or poor communities. In fig. 4 it is shown how community involvement in electricity influence on a number of local factors in the most economical way. These include: community size; population density; distance to national network; locality; level of economic activity. Fig. 4. Factors influencing the attractiveness of off-line solutions. Source: GOGLA Providing Energy Access through the Off-Grid Solar: Guidance for Governments, Jan 2019. The conditions that are created for government investment for private business, of course, play a key role. However, the growth rate also affects the investment model, which actually uses the business to expand its activities. An important factor is the degree of attractiveness of business equity and the focus on the outcome in the medium and long term, rather than a quick return. Despite a significant increase in total investment over the past five years, improving access to finance continues to be called one of the key factors in the long-term and accelerated growth of the PV market for off-grid solutions. In 2017, investments in this sector amounted to $ 284 million, which is 21 times higher the annual investment in 2012, and in whole terms, they exceeded investments in 2012 by more than 40 times, see. Fig. 5, but still lacks the estimated $ 5 billion needed annually to reach off-grid solar power potential fully. An interesting experience on this subject is suggested by GOGLA in its recommendations concerning promoting the increased government access «Providing Energy Access through Off-Grid Solar: Guidance for Governments» to electricity, January 2019. In 2013, in the sector of off-grid solutions for the PV industry began to appear companies working with consumers on the model “pay-as-you-go” – in this case, a type of lease payment with the fact the consumption of energy and the introduction of a certain fixed proportion for the use of hardware provided by the company. Under the terms of the agreement, the user of this service over time becomes the full owner of the off-grid PV-system. By the end of 2015, companies offering the PAYG scheme had collected orders for almost $ 250 million, four times more than the companies in the direct sales segment of off-network PV-equipment. By the end of 2016, this figure has grown to more than $ 360 million. Fig. 5. 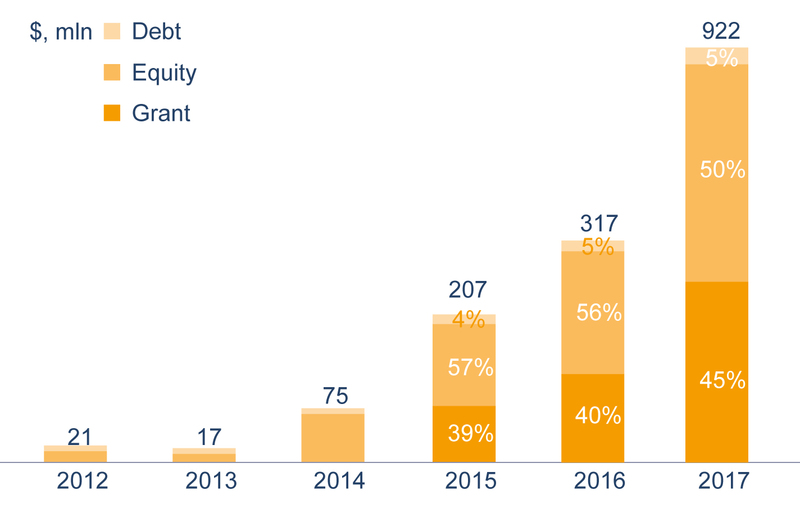 Amount of annual investments by financial instruments in the off-grid segment of the PV industry, $ million accumulated in 2012 Source: GOGLA Providing Energy Access through Off-Grid Solar: Guidance for Governments, Jan 2019. Thus, overcoming the financial gap is not only amount but also properly adjusted local funding flows according to the conditions created by the authorities. While at the beginning the first companies were able to provide investment from local banks, the growth of off-grid financing is currently linked to the development of long-term programs from private equity of market operators, for example, under the “PAYG” scheme. Although it should always be taken into account that long-term programs are more vulnerable to fluctuations in local currencies and current funding opportunities from local institutions may not be sufficient to support the sector, therefore, the free-to-market foreign investment is essential to maintain the sustained growth of the off-grid market. A reliable partnership, mutual responsibility and trust are needed to identify the most effective ways of working together between the government and the private sector to create and maintain favorable conditions for the growth of the offshore solar market. The government should be able to report to the private sector about changes in the political environment and receive feedback from companies on how public policies and programs affect joint efforts to achieve planned transmissions of energy. Effectiveness of joint work also requires enhanced cooperation between the Ministry of Energy and other agencies that can serve customers to expand access to electricity, such as the Ministry of Finance, Education, Health, Agriculture, Environment, and the environment, etc. with the obligatory involvement of local communities as the main beneficiary of the increase in tax payments. Companies in turn need a channel through which they can report on new financial challenges and technological opportunities in this market.